As one of Jeremy’s already existing sponsors, Nike is preparing to cash in on the Linsanity. 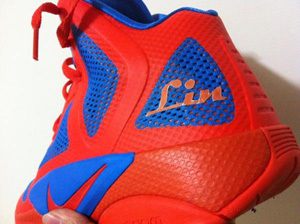 According to ESPN Radio’s blog, Nike is set to release the Nike Hyperfuse 2011 Linsanity PE, pictured above. No word yet, though, on when Jeremy will start sporting the new kicks, nor when they will be made available to the public. This entry was posted on Thursday, February 16th, 2012 at 8:54 pm and is filed under Pics. You can follow any responses to this entry through the RSS 2.0 feed. You can leave a response, or trackback from your own site. Powered by WordPress v 5.0.4. Page in 0.443 seconds.